You’ve got the greatest hair colour in the world (ginger, why thank you), but, what’s that? The pesky winter season is causing your glorious red hair to fall out? That just won’t do, so here are 10 tips for preventing hair loss during winter. During winter, we often go from warm to cold temperatures, indoor to outdoor and back again. 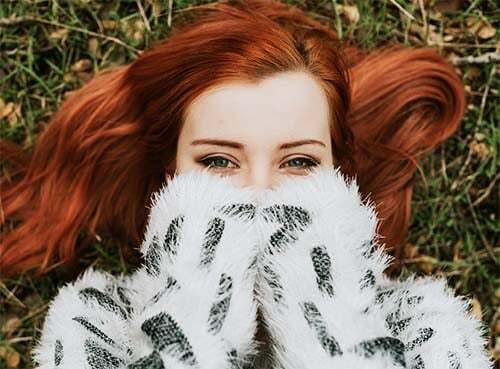 Going between cooler outdoor temperatures and central heating indoors is extremely dry and takes its toll on your red hair, and can lead to dehydration of the scalp as well as making it more brittle and prone to breakage and shedding. Try to keep your hair wrapped under a scarf or under a hat when going outdoors in winter, to prevent that pesky and chilly air getting to it. Using intensive hair masks are all the more important in winter. Not only do these treatments add much-needed moisture to combat the drier winter air, it also helps to protect against any future damage or weakness in the strands, making your hair look healthier and less prone to breakage. Indulge yourself around once a week on a cold winter’s night! Also, consider increasing the length of time you leave on your conditioner before rinsing (we recommend up to five minutes). Better yet, try a leave-in conditioner for extra nourishment and protection. While concentrating on your red hair itself is great, your scalp is quite literally the root of your hair, and shouldn’t be ignored. Invest in a hair serum or oil that’s intended for use on the scalp, and spend some time massaging it in before rinsing. This will also help to prevent dandruff as well as hair loss. Speaking of massages, give your scalp a bit of TLC while you’re showering, with a relaxing head massage. By using your fingers to gently massage the scalp, this increases blood flow to the surface of the skin, making your follicles stronger and helping to pump nutrients to your hair’s roots, which then in time are reflected on your strands themselves. Increasing your intake of certain vitamins, either by supplements or foods, can help prevent hair loss. Vitamin A is excellent for maintaining a healthy scalp, and can be found in carrots, while zinc-rich seafood is handy for strengthening follicles. Meanwhile you can encourage hair growth by snacking on iron-packed nuts and dried fruits. Chemicals on hair can make it more fragile, particularly during winter when it’s at its most vulnerable. Why don’t you boost your red hair’s moisture, ginger colour and strength with all-natural henna-infused hair products designed for redheads? Henna is also known for its ability to prevent hair thinning, so it’s win win win win. Stress affects your body in many ways, and it reaches as far as your red hair, too. Working long hours and experiencing high levels of stress can lead to hair loss, so avoiding stress and getting plenty of sleep will help to combat this. It may seem less preferable given the chilliness of the weather, but using a lower temperature setting on your shower can help your strands retain its strength by closing their follicles. Warm water on your hair opens up the follicles, making it vulnerable to damage from both the water and products. Cooler water helps to keep the strands sealed and protected. Can’t handle the water so cool? Just run a quick cool rinse of your red hair at the end of your washing routine, just to seal the strands before drying. Your hair is at its weakest when it’s wet, so be extra careful with it after washing. Use a wide-toothed comb or your fingers to untangled any knots, and air dry if you can bear it. As we all already know, heat styling causes a lot of damage to our hair. But it’s not just the ends of our hair that suffer, it can also cause hair loss, too. If you can afford to forego heat styling in favour of air drying. Or if you must use heat styling, use the coolest setting. Your hair will thank you. Do you have any tips for preventing hair loss and shedding during in winter? Comment below!